One of the most anticipated times of the year is upon us: the holiday season. While the holidays are a time to get together and celebrate with family and friends, they are also a trying time for those looking to maintain their weight. 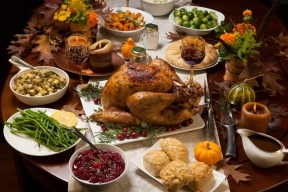 In fact, the average American gains up to six pounds between Thanksgiving and New Year’s! You don’t have to be a statistic this holiday season. Simple swaps can keep you looking trim as a turkey through New Year’s, starting at square one, Thanksgiving dinner. According to research from the Calorie Control Council, the average American may consume more than 4,500 calories and a whopping 229 grams of fat between the appetizers, meal, drinks, and dessert of a traditional Thanksgiving dinner. 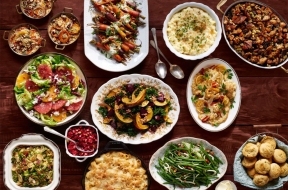 Follow these tips this Thanksgiving to ensure you get your holiday season started off right. Let’s talk turkey – This Turkey Day, when someone asks if you’d like white meat or dark, stay light with white- 3 ounces for women, and 6 ounces for men. Forgoing dark meat (such as the leg or wing) with skin, for white meat without skin can save you about 100 calories and 9 grams of fat. A 3 ounce serving of wings with skin will set you back 230 calories and 12 grams of fat (even before the gravy and all the other fun stuff! ), whereas the same 3 oz of turkey breast without skin is just 160 calories and 4 grams of fat. This swap alone will leave you with more wiggle room for that other fun stuff. Upgrade your potato mash – There’s a reason why mashed potatoes are the quintessential comfort food; they’re usually made with heaps butter and milk (whole milk as a matter of fact!) While butter and milk give mashed potatoes that yummy, creamy taste, they also contribute the big calorie load. This year, embrace the cauliflower trend and make your potato mash a cauliflower mash. By blending cooked cauliflower with non-fat Greek yogurt, chicken stock, grated Parmesan, garlic, and spices like rosemary and pepper you can whip up a delicious alternative to mashed potatoes that is only 60 calories per cup. Drink smart – Between family and the inevitable heated political conversations, a cocktail (or two!) might be necessary for your Turkey Day gathering. While most holiday cocktails are sugar bombs or filled to the brim with full-fat dairy (a cup of eggnog has 430 calories and 58 grams of sugar! ), there are festive drinks that won’t stress your diet as much as your grandparents asking why you’re still single stresses you. This year warm mulled wine may be just what the doctor ordered to take the edge off. To make, just cook dry red wine over low heat with orange and lemon zest along with a mixture of spices like ginger, cloves, nutmeg and cinnamon, all of which add flavor without calories. Put the spices in an empty tea satchel and let sit in the wine for thirty minutes for the flavors to absorb. Add a non-nutritive sweetener of your choice for additional sweetness and serve warm.